Why focus on developing your leadership skills? Your bottom-line depends on it. Leaders and managers directly impact employee performance and contribution. Yet, Right Management’s global research highlights that employee engagement is dangerously low. Even when you bring high levels of commitment, it can be a challenge to optimally motivate and drive your team. -Tap into what your employees are thinking – even if they aren’t saying it. 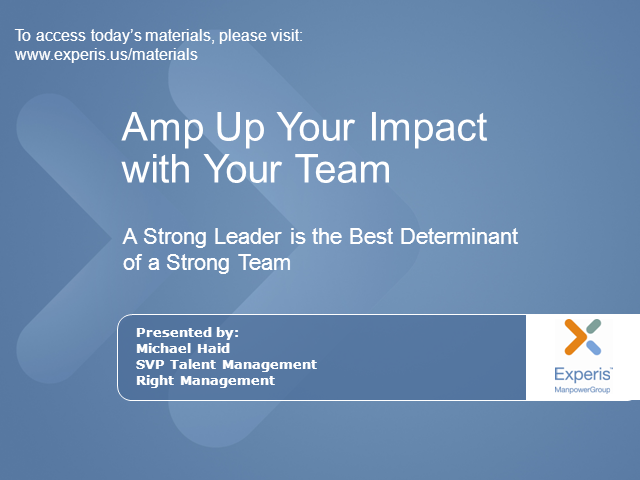 -Understand the leadership behaviors that direct employee performance and commitment. -Build the most effective leadership behaviors to positively impact key business metrics and propel organizational performance. This session is targeted to IT/Finance/Engineering/Healthcare managers, directors and VPs.